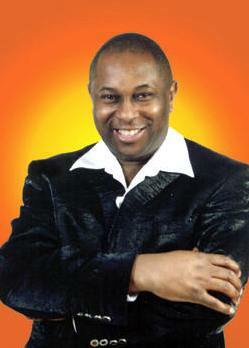 Shenton Dixon, as recently seen on BBC One's "The Voice", was the original performer at the Apollo in the world wide smash hit musical BUDDY. The producers were so impressed with his performance and due to public demand they extended the part to include the song “I’m Gonna Party” which he co wrote. He also was featured in the Original Tamla Motown Musical “DANCING IN THE STREETS” playing along side the late great EDWIN STARR. Appearing virtually every where thought the UK and various locations throughout Europe. Such was the quality of his performance he head lined the show on several occasions and was critically acclaimed with outstanding reviews. I just called, Isn't she Lovely, For Once in my life, My Cherie Amout, Uptight, Sir Duke, Superstition, Sign Sealed Delivered, Part Time Lover, Master Blaster,Do I Do, Happy Birthday to ya to name but a few of the songs in the show. Hear all his greatest hits from Hello Dolly, Wonderful World, to When the Saints Go Marching In and many more. 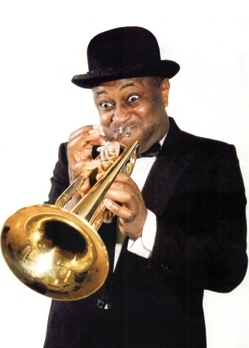 Complete with the legendary gravel voice and distinctive trumpet Shenton takes you down memory lane from the humble days of New Orleans to the Cotton Club & Las Vegas. With great hits like...My first My last My everything, Let the music plat, Just the way you are and The trouble with me... Get ready for a night of Philadelphia Soul. 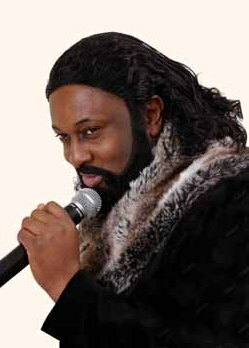 Since the advent of Ally McBeal, the popularity of Barry White has grown throughout the world. Shenton brings back to life 'The Big Papa Himself'. He emulates this larger than life man with love on his mind, he practices what he preaches and he will never ever give it up. With songs like The greatest love of all, On Broadway, In your eyes, Turn your love around, Give me the night, Breezin', Lady Love me one more time, and Love Ballad. 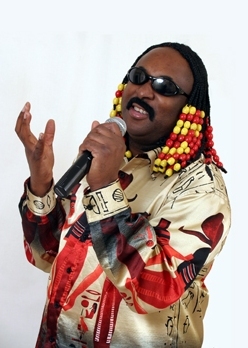 And not forgettin when he combines George's two legendary art forms together (better know as scatting). You are definitely in for a treat in this show. Shenton brings efforlessly to the stage either a Pop Balladeer who can certainly play guitar, or a Maestro Jazz Guitarist who can sing. Either way with over 40 years of George's hits we simply breeze through the show with classic after classic. 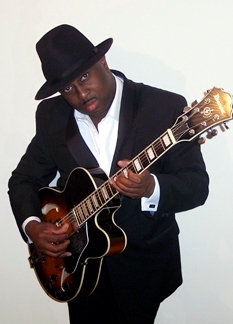 Shenton is "In your eyes" with live guitar, and "Breezin'" to "give you the night." So if you're "Lonely tonight," let him "Love you tender". 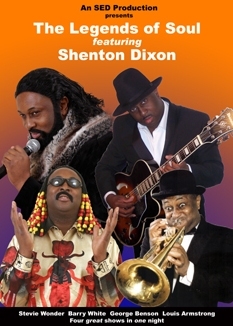 As long as you don't step on his "Blue Suede Shoes", Shenton DIxon is The King of ROCK & ROLL! This King was first seen on National TV in the Black Thron Cider GOLD commercial TV advert Campaign under the slogan "all that glitters is not gold". He has also sung live to the nation twice on Radio 1's Breakfast Show with Sarah Cox and Zoe Ball VIVA Las Vegas and has been in constant demand ever since appearing at various private functions, Cabaret and Special guest appearances. People always compare the characters in the show to sat which one was the best. They may come for a particulat legend, but they go away loving them all. 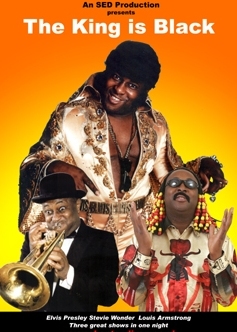 A variety tribute show with a bit of everything. 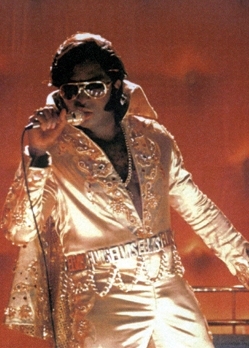 Then we finish with the King of Rock & Roll himself as you've never seen him before. 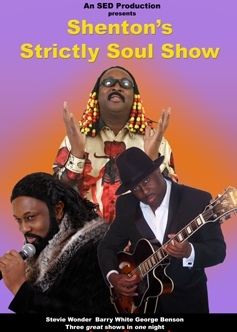 Shenton brings to life and recreates a night of sweet soul music with these Fanctastic Masters of Soul. A must for any soul fan!